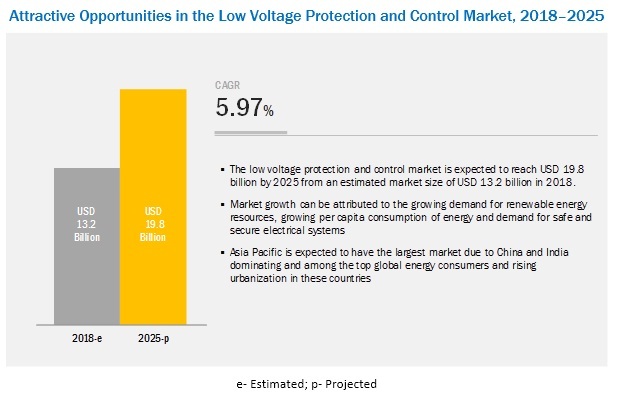 [138 Pages Report] The global low voltage protection and control market is projected to reach a size of USD 19.8 billion by 2025, at a CAGR of 5.97%, from an estimated USD 13.2 billion in 2018. This growth can be attributed to factors such as growth in the demand for renewable energy sources, growing per capita consumption of energy, and safe and secure electrical systems. By product type, the protection equipment segment accounts for the largest contributor in the low voltage protection and control market during the forecast period. The industrial segment is expected to be the largest contributor during the forecast period. The low voltage protection and control market by end-use is segmented into residential, commercial, and industrial users. The industrial segment includes industries such as oil & gas, marine, mining, food & beverage, data center, EV charging, solar, wind, microgrid, and rail. The industrial segment is expected to dominate the low voltage protection and control market by 2025 with the increasing installation of electric vehicle charging stations, data centers, and renewable energy installations. EV charging stations are expected to have the highest growth rate with several countries offering incentives and increased sales of electric vehicles. In this report, the low voltage protection and control market has been analyzed with respect to 5 regions, namely, North America, Europe, South America, Asia Pacific, and the Middle East & Africa. The market in Asia Pacific is estimated to be the largest market from 2018 to 2025. China and India are among the fastest growing countries in the world with rising per capita consumption of energy due to increased industrialization and manufacturing. The countries have seen rapid infrastructure development during the past years. The major players in the global low voltage protection and control market are ABB (Switzerland), Eaton (Ireland), Fuji Electric co. ltd (Japan), Hitachi (Japan), Rockwell Automation (US), Schneider Electric (France), Siemens (Germany), Yaskawa (Japan), CHINT Group (China), WEG SA (Brazil), Legrand (France), Toshiba (Japan), and Emerson Electric Co. (US). In March 2018, Rockwell introduced Workbench software version 11 to provide a single design environment for the programming of Micro870 PLC. The software can also be used to configure Allen-Bradley PanelView 800 graphic terminals, PowerFlex AC drives, Kinetix component servo drives, electronic overload relays, light curtains, and configurable safety relays. In February 2018, Siemens AG announced the launch of its new generation of soft starters to simplify the demanding drive requirements. The new Sirius 3RW5 soft starter is of 3-phase asynchronous motors from 5.5 to 1,200 kW. In July 2017, Eaton launched its new Air Replacement (AR) series circuit breakers that are made to replace vintage DS and DSII series circuit breakers across low-voltage power applications, including the power generation, industrial, commercial, and healthcare sectors. In October 2016, Rockwell Automation, Inc expanded the Allen Bradley Bulletin 140G Molded Case Circuit Breakers to offer more comprehensive, fast-acting short-circuit protection, and protection against overload and ground-fault conditions. It will help engineers to achieve higher short circuit ratings in the control panel because of their current-limiting ability and reduce the energy let-through by more than 50%. The report identifies and addresses key markets for low voltage protection and control, which would help manufacturers review the growth in demand. The report addresses the market share analysis of key players in low voltage protection and control market, and with the help of this, companies can enhance their revenues in the respective market. The report provides insights about emerging geographies for low voltage protection and control market, and hence, the entire market ecosystem can gain competitive advantage from such insights. This study involved 4 major activities in estimating the current market size for low voltage protection and controls. Exhaustive secondary research was done to collect information on the market, the peer market, and the parent market. The next step was to validate these findings, assumptions, and market sizing with industry experts across the value chain through primary research. Both top-down and bottom-up approaches were used to estimate the total market size. Thereafter, the market breakdown and data triangulation was done to estimate the market size of the segments and subsegments. This research study involved the use of extensive secondary sources, directories, and databases, such as Hoover’s, Bloomberg BusinessWeek, Factiva, and OneSource, to identify and collect information useful for a technical, market-oriented, and commercial study of the global low voltage protection and control market. The other secondary sources included annual reports, press releases & investor presentations of companies, white papers, certified publications, articles by recognized authors, manufacturer associations, trade directories, and databases. The low voltage protection and control market comprise several stakeholders such as end-product manufacturers, transmission and distribution operators, residential and end-users in the supply chain. The demand side of this market is characterized by its applications such as commercial, residential, oil & gas, marine, mining, datacentre, EV charging, solar, wind, microgrid, rail, and others. The supply side is characterized by advancements in protection technologies such as comprehensive and fast reacting products and increased emphasis on low voltage protection and control’s operational lifetime. Various primary sources from both, the supply and demand sides of the market were interviewed to obtain qualitative and quantitative information. After arriving at the overall market size-using the market size estimation processes as explained above—the market was split into several segments and subsegments. To complete the overall market engineering process and arrive at the exact statistics of each market segment and subsegment, the data triangulation, and market breakdown procedures were employed, wherever applicable. The data was triangulated by studying various factors and trends from both, the demand and supply sides, in the commercial, residential, oil & gas, marine, mining, datacenter, EV charging, solar, wind, microgrid, rail, and others. Product Type, End-User, and Region. ABB (Switzerland), Eaton (Ireland), Fuji Electric co. ltd (Japan), Hitachi (Japan), Rockwell Automation (US), Schneider Electric (France), Siemens (Germany), Yaskawa (Japan), CHINT Group (China), WEG SA (Brazil), Legrand (France), Toshiba (Japan), and Emerson Electric Co. (US). This research report categorizes the low voltage protection and control market based on product type, end-use, and region.